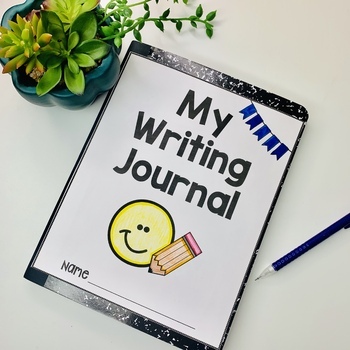 Writing prompts or journal entries are wonderful ways to help young students grow confident in putting their written words on paper. 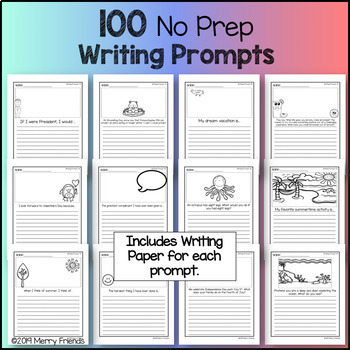 It is not unusual to have students begin with one or two sentences and grow into wanting MORE paper for their response or story. 1. 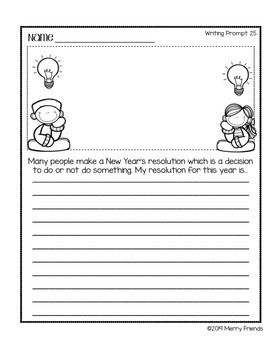 Individual worksheets that are completed 2-3 times per week and sent home when finished. 2. The papers may be cut out and glued into a composition notebook and then written. (The pages are intentionally created smaller for this purpose.). I enjoy this approach for a couple of reasons. First, all papers are kept in one notebook and at the end of the year sent home as a collection. Students enjoy reminiscing not only at what they wrote, but also how far their writing capabilities have come. Secondly, the coloring of the art, cutting and gluing gives time and space for each child to begin thinking of what they would like to say before jumping into the blank page. 3. 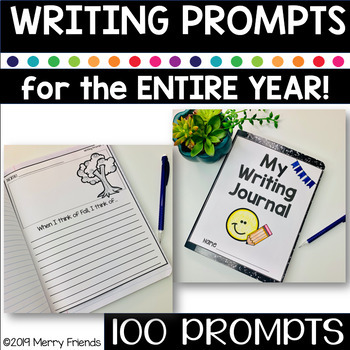 I have cut the prompts out (individual cards to print are provided as well) and placed on straws and put in tins to be used in writing centers. Be sure to FOLLOW our store! All NEW resources are HALF OFF for the first 24 hours!